If you’re the type who likes (or aspires) to camp in remote sites far from electrical hookups, you’ve probably already put a few upgrades in your Airstream. 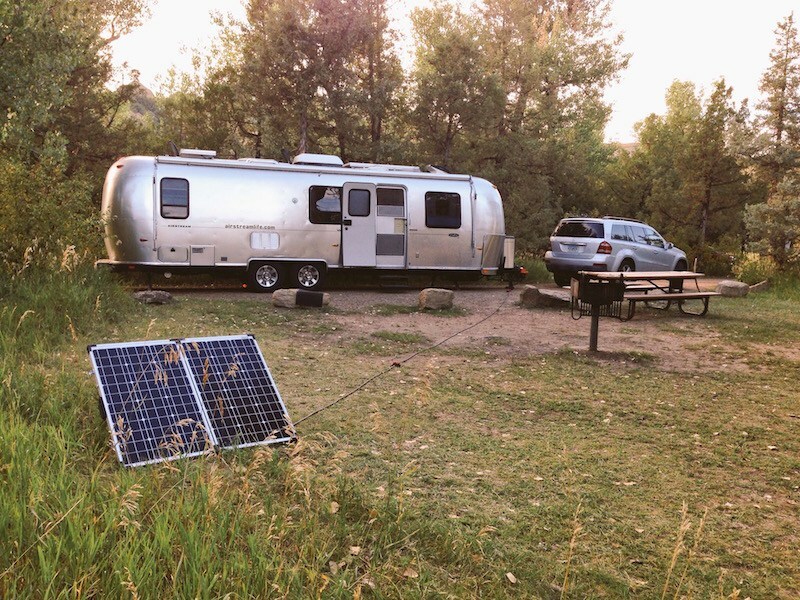 The standard pair of batteries installed in an Airstream is fine for a night or two without campground power, but after that most people start looking at a generator or solar panels, and larger batteries to extend their camping time. Serious boondockers sometimes take it step further, with an inverter to run a few 120-volt AC appliances like the TV or microwave. An inverter, for those who aren’t sure, is simply a device that turns the battery power (12 volt DC) into the type of power you’d get from a plug in your home (120 volt AC). It’s the exact opposite of what the built-in converter in your Airstream does when plugged into campground power. 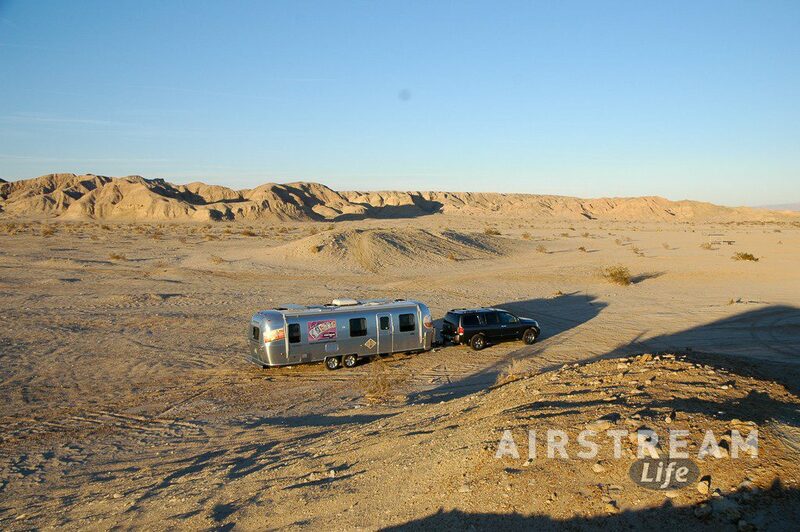 A few Airstreams are factory-equipped with inverters, but even those aren’t usually capable of powering every outlet in the Airstream. They’re usually limited to a few outlets and produce a maximum of 1000 watts, which won’t run your microwave oven. Worse, instead of producing nice clean smooth electrical current, most inverters on the market produce a sort of choppy electricity (called “Modified Sine Wave”). This is OK for most uses, but it makes some devices hum and buzz. Flat-panel TVs, computer power adapters, printers, and microwave ovens in particular don’t like it. Until recently, a “Pure Sine Wave” inverter that produced utility-grade power was a pretty expensive item. A 2000 or 3000-watt inverter could easily cost $2,000 ore more, plus installation. This is the major reason most inverter designs went the cheaper and less compatible route. These days Pure Sine inverters have become much less expensive. Leading this trend, Xantrex recently introduced their new Freedom HFS Inverter/Charger specifically for the RV market. We got one and installed it in an Airstream for evaluation. …comes in two specs: 1000 watt and 2000 watt. Because our goal was to provide “whole house” power (meaning powering every outlet and every appliance except the air conditioner) we opted for the 2000 watt model. Installation is straightforward. Because the Xantrex Freedom HFS is also a power converter/charger, it replaces the existing converter/charger in the Airstream. That makes wiring fairly simple. Two 30-amp AC cables go to the inverter (campground power in, and inverter power out), and two heavy gauge DC wires connect to the battery (positive and negative). A networking cable plugs into the inverter and runs to the remote control panel, which you can mount anywhere inside the Airstream. Those five connections (two AC, two DC, one remote) are all that are required. Because a big inverter like this can draw a lot of power, it must be located as close as possible to the batteries. That minimizes electrical “line loss” through the wires to the batteries, so the inverter can run most efficiently. In some Airstream floorplans this means stringing a cable from the new inverter location to the existing electrical circuit breaker panel. Keep in mind that the Xantrex Freedom HFS can be mounted on a wall inside a cabinet if needed, and that’s often the best way to preserve storage space for other items. The unit does have a cooling fan that often runs when it is heavily charging the batteries or supplying AC power to a large appliance (like a microwave oven) so if you mount it under the bed be prepared to hear some “white noise” once in a while. The rest of the time, it’s silent. The possible need to run wiring through the Airstream, and the requirement for heavy gauge cables to the batteries means that professional installation is a good idea for most people. A proper installation is crucial for efficiency and safety, so don’t cut corners here. Our installation took five man hours at a professional shop. The factory-installed set of two Group 27 batteries is really not enough for a big inverter like the 2000-watt Xantrex. If you want to go with a whole-house inverter, budget for a much larger battery bank at the same time. You’ll also want an amp-hour meter (like the Xantrex LinkLite or LinkPro) if you don’t already have one. A large inverter can drain the batteries pretty quickly, so accurate metering of battery capacity is important. We were very impressed with the performance of the Xantrex Freedom HFS in our on-the-road tests. Not only did it seamlessly switch from campground power to battery power as needed (so quickly that no appliance lost power) but it consistently provided between 119 and 121 volts. That’s far more reliable voltage than the power we see at most campgrounds. Both the 1000 watt and 2000 watt models of the Xantrex Freedom HFS are also 55-amp three-stage DC chargers, which means they’ll charge your batteries as well or better than whatever charger you currently have. Battery overcharging is not a worry, thanks to what Xantrex calls “Smart Battery Management” and built-in charge settings for standard “wet cell” batteries, AGM batteries, and a fixed voltage setting for new lithium batteries. What can you run with a 2000-watt inverter? Any low-wattage appliance is simple of course, like battery chargers. The Xantrex Freedom HFS inverter had no trouble with a stick blender, toaster, vacuum, computer charger or TV. Amazingly, it will also run a hair dryer, vacuum cleaner, most microwave ovens, toaster or coffee maker—but keep in mind you should only run these high wattage appliances one at a time, and not for very long. In general, if the appliance pulls 1,500 watts or less, it will probably be fine with the 2,000 watt inverter (allowing some leeway for surges and line loss). However, be wary of microwave oven wattage ratings. Those ratings are often “output” power (meaning cooking power) and the microwave may pull many more watts from the battery. In testing we observed a “1,000 watt” microwave draw 1,800 watts while in operation. And while it might seem obvious to some, we should mention this: No, you can’t run the air conditioner through an inverter. It draws too much power. If your installer hasn’t rewired the air conditioner through a separate sub-panel to isolate it from the inverter, you’ll have to remember not to turn it on while you’re using the inverter. Likewise, be sure to set your refrigerator to the “GAS” setting while you’re using the inverter, otherwise the fridge will stay in AC power mode and chew up the batteries quickly. Inverters draw a small amount of power even when they aren’t actively powering an appliance, so tap the green power button on the Xantrex remote panel whenever you don’t need it. As you can see, there’s a small learning curve associated with having always-available AC power. But we found that after only a week or having it, we were hooked on the convenience of being able to run the coffeemaker and reheat a leftover in the microwave even while camped far off in remote places. The Xantrex Freedom HFS 2055 is available online for about $800-900.